Israeli right wing Education Minister Naftali Bennett called on Israel to terminate the transfer of tax revenue to the Palestinian Authority (PA), in response to both Palestine’s new membership in the INTERPOL and to the current reconciliation process between Hamas and the PA. 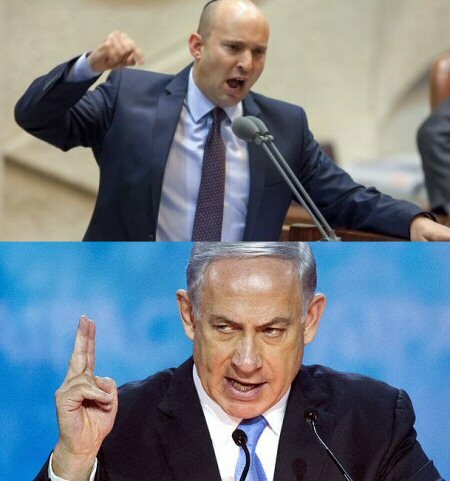 This is not the first time Bennett has made extremist right wing statements, according to the PNN, as he previously said that more people should have been “eliminated” in the war on Gaza, calling them “terrorists”. Bennett said that three conditions would be set as conditions for continuing to transfer funds to the PA, including the return of two bodies of Israeli soldiers killed in the 2014 war on Gaza. Bennett is expected to bring up these demands in the upcoming cabinet meeting. Netanyahu spoke at a Likud meeting in Ma’aleh Adumimin settlement block where he described an “imaginary appeasement where the Palestinian side is reconciling at the expense of our existence,” adding that anyone who discusses a peace process must recognize Israel as a “Jewish” state. Netanyahu’s remarks came just hours after Bennett’s call for the halt of the revenue transfer. Palestinian reconciliation: Why is it likely to succeed now? For a change, all parties concerned seem to be eager to see Palestinian reconciliation succeed. Each player has its own reasons, of course. Yet, it would not have been possible to come this far so quickly had it not been for the deepening humanitarian crisis inside the Gaza Strip and the growing predicament Hamas, which controls Gaza, finds itself in as a result. There is no doubt that the siege imposed on Gaza by Israel and Egypt has achieved its objectives. Life has become so unbearable that public opinion within the Strip is overwhelmingly in favour of any deal that is said to promise easing the pressure. This has prompted Hamas to express readiness to make concessions that had until recently been inconceivable. The full extent of these concessions is unclear and the deal under discussion is shrouded in ambiguity. 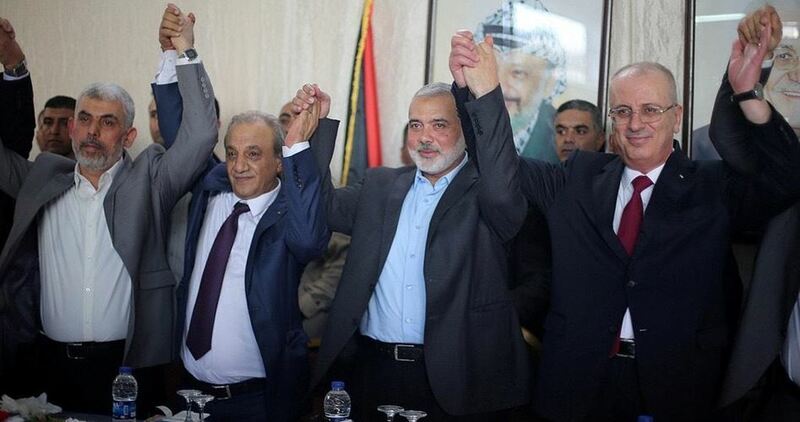 What is known thus far is that Hamas has agreed to disband its own administrative committee in charge of the Gaza Strip in a prelude to handing over control to the Ramallah-based Palestinian Authority (PNA), whose Prime Minister Rami al-Hamdallah arrived in the Strip on Sunday. As part of the new arrangement, Hamas is expected to relinquish control over the crossings with Egypt and Israel. While some Hamas leaders have maintained that the movement's military force is not for negotiation, Fatah spokespersons insist that reinstating the PNA in Gaza would have to mean an end to all military manifestations outside the control of the PNA. It is inconceivable that the Americans and the Israelis, who are said to be in favour of the current reconciliation effort, will settle for anything less than dismantling Al-Qassam, Hamas' military wing. This is believed also to be the position of the government in Cairo. The other important factor that brought about a shift in Hamas' position was the election of a new leadership. Over the past decade, Hamas developed a complex organisational structure that consisted of three regional administrations – one for Gaza, a second for the West Bank and a third for the diaspora – and an overarching one. In the past, decision-making within Hamas was a laborious process. The head of the political bureau had to consult with the leadership of every region as well as with his comrades in the overarching structure. When former Hamas leader Khaled Meshaal once violated this norm by individually consenting to a proposed arrangement with PNA President Mahmoud Abbas without consultation, he was severely criticised, particularly by Hamas figures inside Gaza. Now the exact opposite is happening. 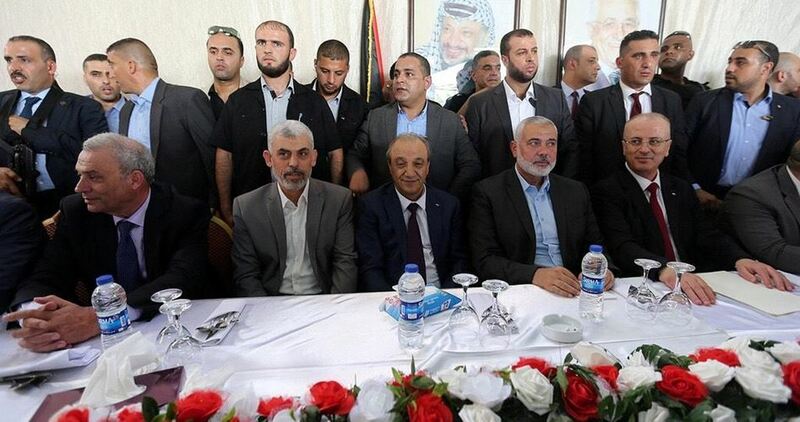 Hamas leaders in Gaza are accused of not being bothered to consult with anyone. It is no longer secret that tension has been building within the movement since Sinwar decided, singularly, to meet and negotiate with his former schoolmate Mohammed Dahlan, a close associate of Abu Dhabi’s Crown Prince Mohammed Bin Zayid and an arch enemy of Hamas. But to his credit, Sinwar seems to be consistent with the public mood within Gaza. People are not only exhausted because of the siege and want to see it end but are also tired of remaining prisoners of old rivalries. Dahlan was Fatah's main security man when war erupted between Fatah and Hamas in the Strip in June 2007, resulting in the death of dozens on both sides and with the eventual takeover by Hamas in Gaza and by Fatah in the West Bank. Today, the new leaders of Hamas want to turn over this dark page in the history of the strip. Hamas' Cairo meetings with Dahlan, who now commands the loyalty of nearly half of Fatah's members of the Palestinian Legislative Council and is a serious rival of Abbas, paved the way for what is known as community reconciliation. With funding from the United Arab Emirates and cooperation from Egypt, Dahlan set up a fund to compensate families who are willing to be part of a programme aimed at healing old wounds. According to Reuters, each family stands to receive the sum of $50,000 in exchange for publicy renouncing demands to avenge the deaths of family members. Finally, Hamas has been considerably weakened in recent years. Since 2008, it has been the target of three major Israeli military campaigns and numerous smaller attacks and incursions. Yet, the most devastating development has been the success of the UAE and Saudi Arabia in aborting the Arab Spring. The 2013 military coup in Egypt was a particularly catastrophic blow to Hamas. Since then, the movement has been left deserted and under siege. Disagreement with Iran over Syria earlier cost it hundreds of millions of dollars in Iranian sponsorship of its Gaza administration not to speak of the lost military and logistical support both Iran and Syria used to provide. Palestinian reconciliation is likely to succeed this time because all parties concerned desire to see it succeed. Egypt has a chronic security problem in Sinai and has now concluded that Gaza can be part of the solution rather than the problem. The Arab counterrevolution states, particularly the UAE and Saudi Arabia, believe that reconciliation would pave the way for official diplomatic and trade relations with Israel. It is no secret that these Arabs are dying to go public with their Israeli ties but are barred by the lack of progress in the peace process. 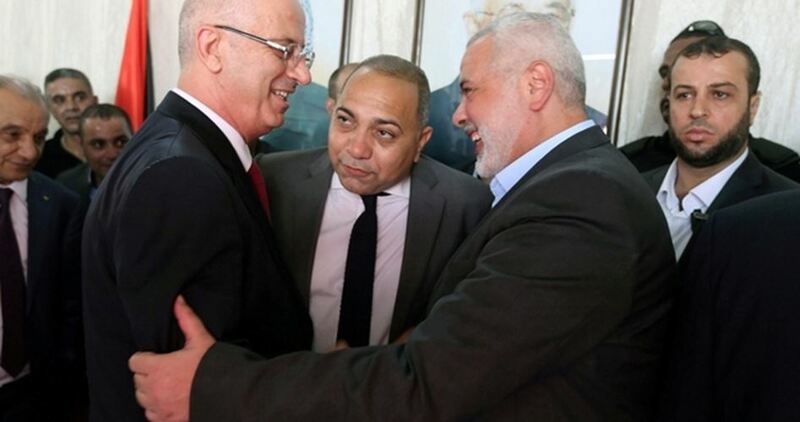 They believe that once Fatah and Hamas are reconciled, the PNA and Israel can resume final-status talks, and once the Palestinian Israeli conflict is fully resolved they will be able to justify ending their own public hostility toward Israel. 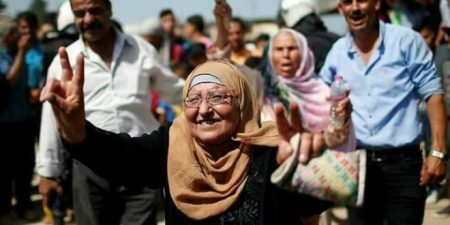 It is very likely, therefore, that the success of Palestinian reconciliation will mark the end of an era and the beginning of another in the history of Palestinian resistance. If so, and if ever allowed, Hamas may, under the new terms, revert gradually to being a modified version of what it used to be before December 1987, a socio-religious movement. But will it ever be allowed? With the military in charge in Egypt it is highly doubtful. - Azzam Tamimi is a British Palestinian academic and political activist. He is currently the chairman of Alhiwar TV Channel and is its editor-in-chief. His article was published in the Middle East Eye website. The spokesman of Hamas Movement, Fawzi Barhoum, called for responding to Israeli Prime Minister Benjamin Netanyahu’s remarks on the reconciliation by enhancing more unity and speeding up putting an end to the internal division. Barhoum affirmed, on a statement on Tuesday, that the Israeli occupation is the only party that is affected by the Palestinian unity and reconciliation as representing a source of power to the Palestinians. He pointed to the importance of coming up with a national strategy that unifies all the factions of the Palestinian people in order to get ready to confront the Israeli occupation and defend the rights of the Palestinian people. Israeli Prime Minister Benjamin Netanyahu vetoed the Palestinian reconciliation, putting three conditions to accept it including recognition of Israel, dissolving the armed wing of Hamas Movement and halting its relation with Iran. "The Palestinian Authority cannot reconcile with Hamas at Israel’s expense," Netanyahu said on Tuesday, in his first reaction to the latest unity deal between the Hamas and Fatah factions, according to a statement by Netanyahu’s office. "As part of its reconciliation, the Palestinian Authority must insist that Hamas recognizes Israel, dismantles its military wing and breaks off ties with Iran. We cannot accept fake reconciliation on the Palestinian side that comes at the expense of our existence," he added. Netanyahu made the statement in coincidence with the Palestinian consensus government, led by Rami al-Hamdallah, taking over its responsibilities in Gaza Strip in light of the Palestinian reconciliation supervised by Cairo. Israeli and American pressures on the Palestinian Authority had affected previous reconciliation efforts and led to the continuation of the internal division. Hamas Movement called on the consensus government and Palestinian Authority President Mahmoud Abbas to immediately lift all of the punitive measures imposed on Gaza Strip. The spokesman of Hamas, Fawzi Barhoum, said in an exclusive statement to the PIC on Tuesday that his Movement has offered all what can be done in order to allow the government take over its responsibilities. “Hence, Fatah Movement has to abide by its promises of lifting punitive measures imposed on Gaza as soon as Hamas dissolves the administrative committee and immediately after the Palestinian Authority government assumes its responsibilities”, Barhoum said. The statement of the consensus government during its first meeting in Gaza has ignored the Gazan demands of rescinding the punitive measures that have been lately imposed on the coastal enclave. 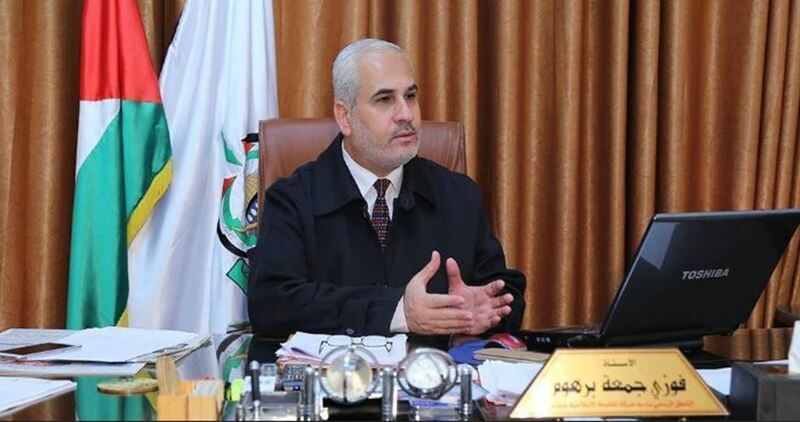 Head of Hamas's Political Bureau, Ismail Haneyya, on Tuesday expressed his confidence in the success of the reconciliation initiative, saying that his Movement has accepted Egypt's invitation to hold a meeting in Cairo next Tuesday to discuss all of the reconciliation files. 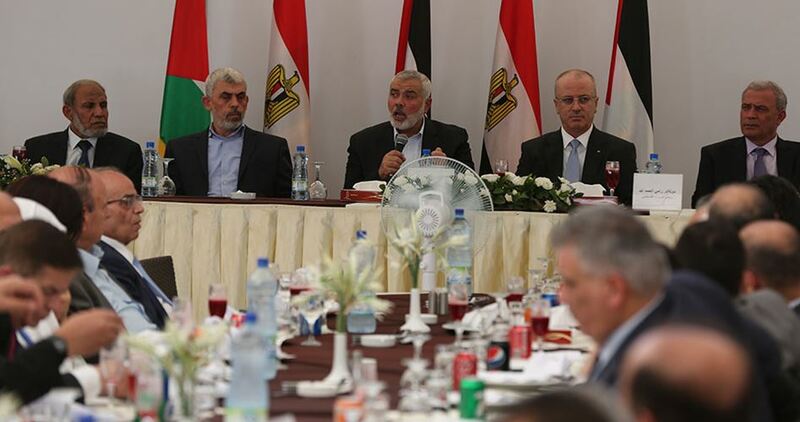 Haneyya said in his speech during a luncheon in honor of the Palestinian Prime Minister and the Egyptian delegation in Gaza that Hamas did not go for reconciliation under any pressure, but the decision came from a sincere desire to defend the Palestinian cause. He pointed out that reconciliation is not limited to Gaza, but it includes the West Bank and the rest of the Palestinian territories. "This reconciliation is destined to succeed," Haneyya stressed, adding, "This is the first step of many miles to go and we are confident the page of division has been turned over forever." For his part, Prime Minister Rami Hamdallah said that Hamas is a strategic partner in this historic stage, praising the Movement's efforts to make the reconciliation succeed. Hamdallah added, "It's time for our people to enjoy reconciliation and unity," and noted that several committees will be formed to address the pending issues. Egyptian president Abdul-Fattah as-Sisi has asserted his country’s keenness on achieving the Palestinian unity and helping the Palestinian people have a quantum leap in their lives. 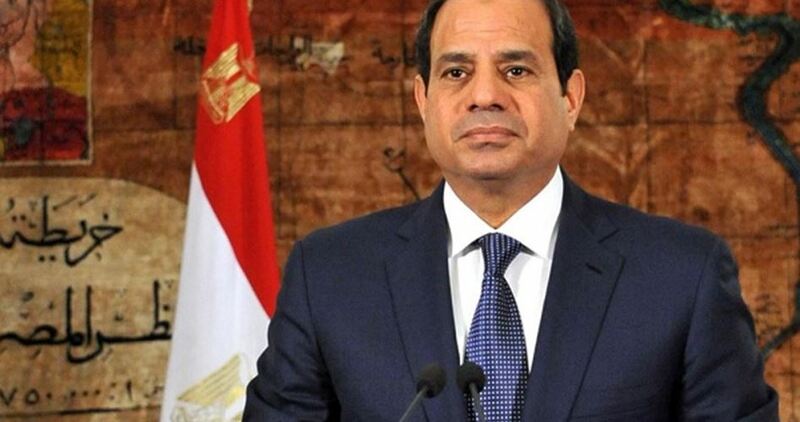 Sisi made his remarks in a recorded speech delivered during the Palestinian cabinet meeting that was held on Tuesday in Gaza in the presence of Egyptian intelligence chief Khaled Fawzi. “As I am addressing you on this great day, I wish the Palestinian people every success in realizing their aspiration for the establishment of a state,” the Egyptian president said. He emphasized that the Egyptian leadership would always remain a prominent supporter for the Palestinian demands during its meeting with other leaders of the world or during its participation in international conferences. “The whole world is looking forward to your efforts to achieve the reconciliation among the Palestinian people and respects your determination to overcome all the obstacles that led to division and dissonance,” the president said. He also warned that no one would be a winner if the division persisted, adding that the sole beneficiaries of the Palestinian discord are the parties that want such situation to remain with no change. The Palestinian Authority (PA), represented by PM Rami Hamdallah, arrived in Gaza this afternoon, through Erez checkpoint, for an official welcome and made optimistic statements in regard to a national reconciliation, after 10 years of division between the West Bank and Gaza Strip. The cabinet is scheduled to hold its first meeting in Gaza on Tuesday morning, according to the PNN, after which it will assume its official duty as the government in charge of the Gaza Strip. The reconciliation was facilitated three weeks ago when Hamas, the defacto ruling party in the Strip since 2007, dissolved the administrative committee it had established in March to run Gaza affairs, and agreed to turn over power to the Ramallah-based Palestinian Authority, but the movement’s armed wing remains the dominant power in the Palestinian enclave of two million people. Hamas’s reversal was the most significant step toward Palestinian unity since the government was formed in 2014, as it failed to function in Gaza specially with the growing electricity and water crisis. Analysts said narrowing internal divisions could help western-backed Abbas counter Israel’s argument that it has no negotiating partner for peace with the Palestinians. A Hamas police honor guard and hundreds of Palestinians, many of them waving Palestinian flags, awaited Hamdallah at the Israeli checkpoint which the prime minister and his motorcade passed. “The road ahead will be long and hard, but momentum of reconciliation and peace should not be missed,” Nickolay Mladenov, the U.N. special coordinator for the Middle East peace process wrote on Twitter. 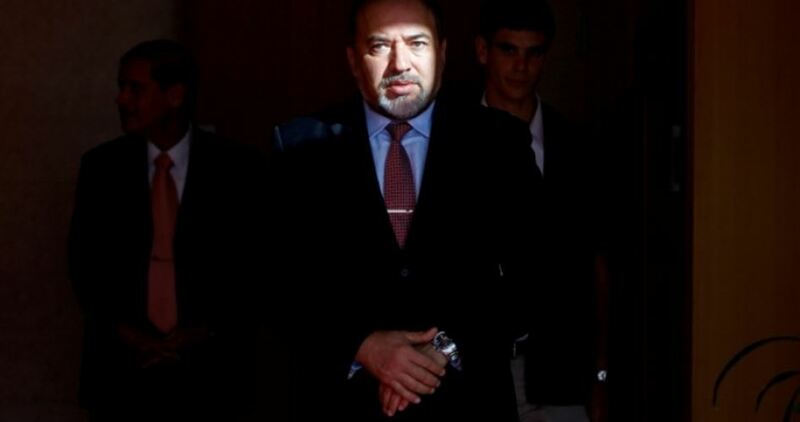 Israel’s war minister Avigdor Lieberman warned on Monday that the next war is likely to feature attacks on population centers and civilians, according to Haaretz daily. 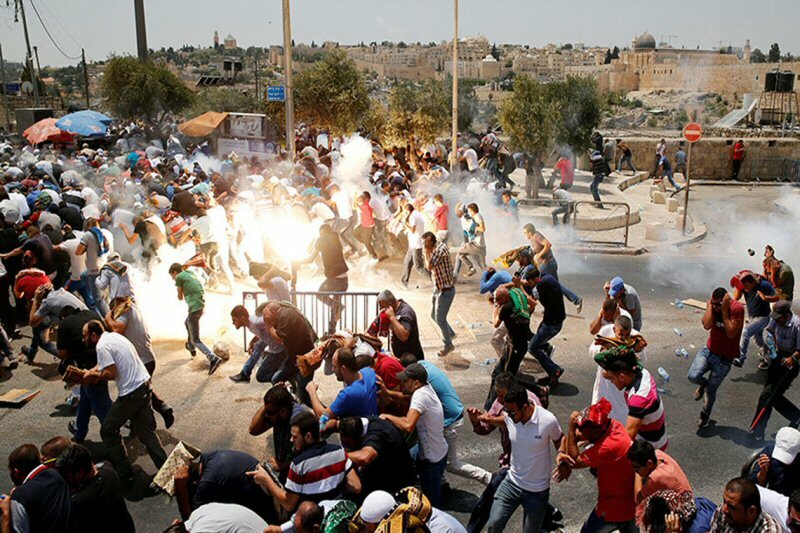 "We live in a new reality of a new Middle East, which is much worse than the old Middle East. And in this terrible new reality, we have yet to face difficult tests,” he added. "The sovereign, too, regardless of whether he controls his territory or not - as soon as a hostile action takes place, the sovereign will also bear all the responsibility," the war minister further threatened. The international community has ceaselessly sounded alarm bells over the Israeli aggressions on civilian homes, infrastructure, and unarmed communities across the occupied Palestinian territories and the blockaded Gaza Strip, in aggressions deemed by the international law as crimes against humanity. Israeli Former Foreign Minister Tzipi Livni has claimed that only Jews have the national right for self-determination in Israel. Livni, whose Hatnuah faction forms part of the opposition Zionist camp, made the remarks as part of ongoing discussions in the Knesset about the exact nature of a proposed “nation-state bill,” which seeks to consolidate the state of Israel’s nature as a “Jewish” state. The demand is opposed by others, including influential figures such as Likud member and coalition chair David Bitan. Many Palestinian citizens of Israel, who have always faced institutional discrimination, argue that real equality is impossible so long as Israel is defined as a “Jewish state” rather than a state of all its citizens. Israel’s Declaration of Independence announces the establishment of a “Jewish state,” but does not mention “democracy” once. The right to equality is not currently enshrined in Israeli law.